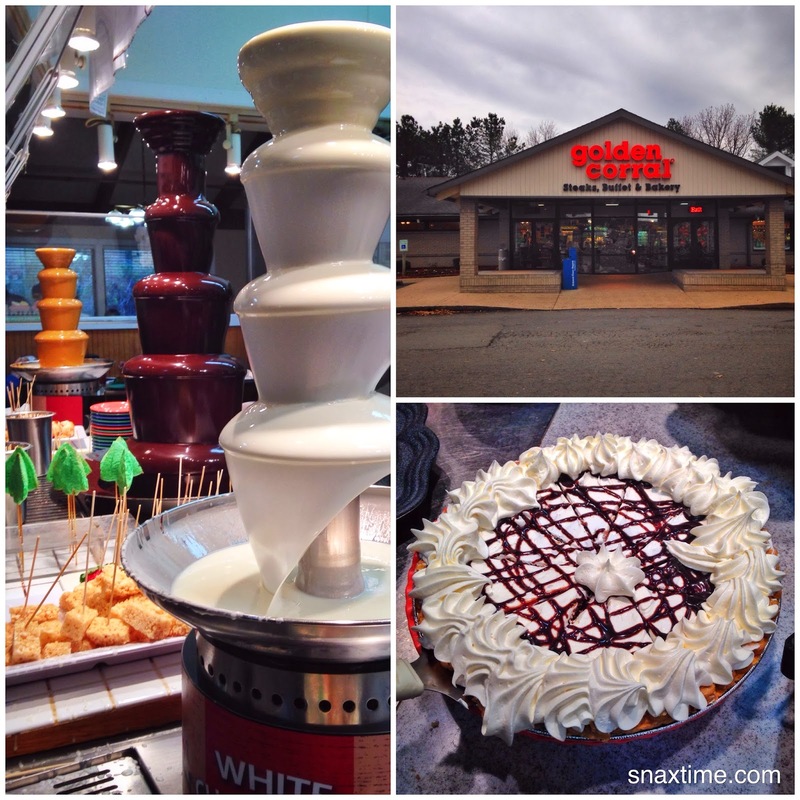 We decided to treat the folks to lunch one day when visiting Richmond, VA for the holidays. 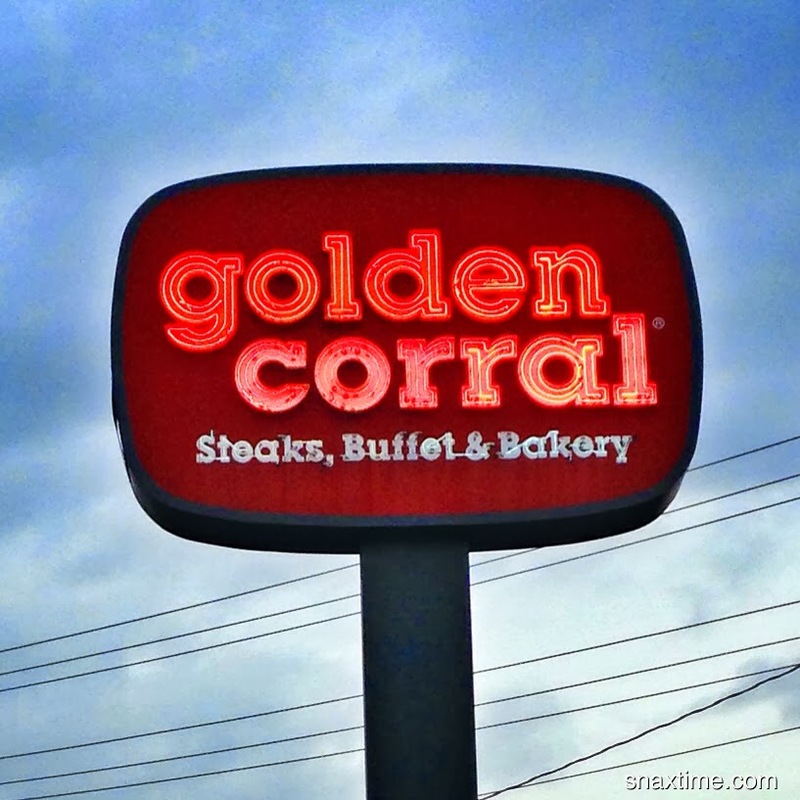 Frustrated that there are no Golden Corrals in New York City, we took the opportunity to eat at one and made our way over to the Golden Corral located at 11 South Providence Rd right off the Midlothian Turnpike. Judging by the old school neon road sign, understated brick architecture and giant parking lot, it was apparent that this was not only a popular destination but one that has been here for quite some time. The parking lot was jam packed and it was difficult to find parking, which was surprising since it was right before 4PM, an off time to have lunch. The entranceway gave away the fact that this is a family friendly restaurant. There were several arcade games and toy claw machines and plenty of people of all ages lining up to put in drink orders. A glance at the menu sign clarified that the lunch buffet price special ended at 4PM, hence why so many people were scrambling to get through the line and straight to the buffet. While waiting we noticed several framed certificates and awards for this certain location, a good sign. We put in our drink order (we ordered a Diet Pepsi) then paid at the register for 1 adult and 2 seniors. The total came to $26.28; so far this was indeed turning out to be what Golden Corral calls itself, “America’s Best Dining Value." The lady at the register was full of festive cheer and was a real darling. She ran out of receipt paper and had to call over her manager to help load a now roll, for which she was very apologetic. After a minute we were sent on our way to find a table and start chowing down. We found an empty table towards the back of one of the many rooms. A sweet waitress came right over and told us where to find plates and cutlery and asked if we needed anything else. The service thus far was outstanding! We started off at the salad bar and made ourselves an iceberg lettuce salad (there are other types of greens as well) with carrot shreds, white onion, shredded cheddar cheese, ham cubes, bacon and blue cheese dressing. We went ahead and added a scoop of tuna salad, macaroni salad and a deviled egg as well. When making our way back to the table, we noticed the seafood salad, our favorite, but decided to skip it and leave room for the hot food that was to follow. The table came stocked with black pepper which we dusted all over our first course. Everything on the salad plate was spectacular! The deviled egg and macaroni salad were classically prepared, the vegetables were all crisp, cold and fresh and the extra fixin’s were spot on. For our second course we hit up the various hot food stations and compiled quite an impressive plate. One of our favorite items was the all-American meatloaf which was moist, hot and smothered in bright red, sweet ketchup. SO GOOD! The meatloaf paired well with the dirty rice which had seasoned ground beef mixed in. The pulled pork was sweet and smokey and the popcorn shrimp and hushpuppy were crisp and savory. We thoroughly enjoyed the baked spaghetti which was covered in melted mozzarella and the nachos with chili, pico de gallo, lettuce, salsa and sour cream were a tasty way to finish off the plate. For the third round, we got different hot food items that we couldn’t fit on the first plate! The stand out stars of this plate were the fried chicken and jumbo yeast roll. Yeast rolls like this are what make American food buffets so special. The roll was slightly sweet, super soft and yeasty, warm and slathered and hot melted butter! The fried chicken was perfection and tasted delicious with the exquisitely prepared sides of scalloped potatoes, mashed potatoes and gravy, green bean casserole, mac and cheese and sweet, buttery cooked carrots. The pork ribs were fall-off-the-bone tender and scrumptious. We were SO full, but felt that dessert was called for so we went back for one more round! This time we opted for the carrot cake with cream cheese frosting, cherry New York style cheesecake, fudgey iced brownie, banana pudding and bread pudding. What can we say? Everything once again was the bee's knees! The bread pudding was hot and crusty on the outside and gooey on the inside with strong notes of cinnamon. The banana pudding was classic and rich with lots of fresh banana flavor. The fudgey brownie was super chocolatey and warm and the carrot cake and cheese cake were both silky and creamy sweet. Throughout the meal, the folks were also vastly impressed. They especially liked the pork ribs and Mexican rice (which we didn’t try unfortunately). The waitress was very attentive and constantly cleared plates and refilled drinks. 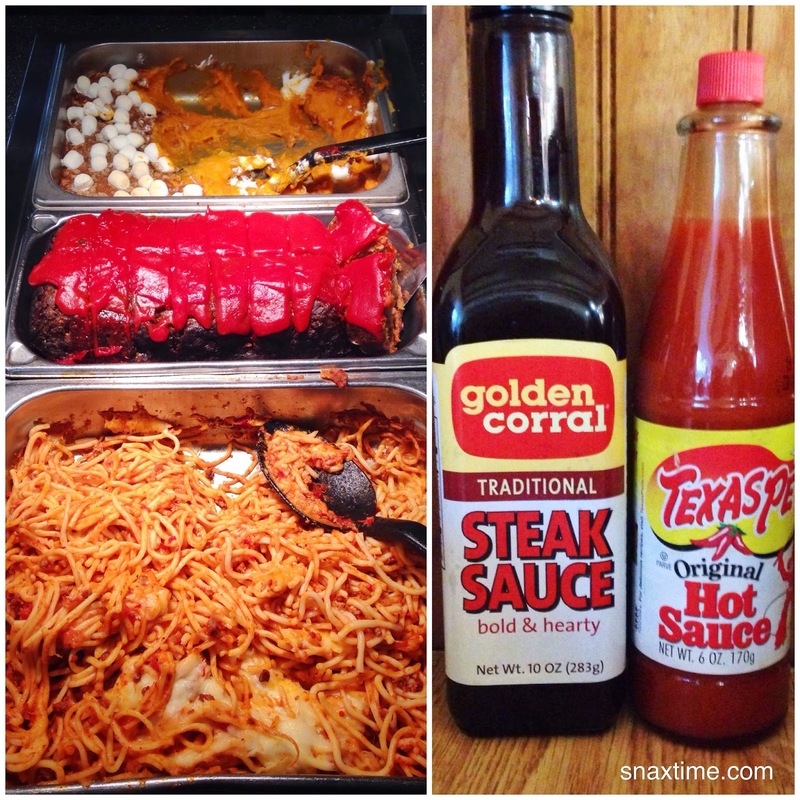 She offered to bring over hot sauce and we were pleasantly surprised when it turned out to be Texas Pete, which was just wonderful on the fried chicken and mac and cheese. It was a shame that we didn’t have more room in our tummies to try even more food. We never got to the steak, ham, sweet potato casserole or Bourbon Street Chicken and the "Triple Fountain Yum" and chocolate chess pie looked impressive to say the least. We’ll be trying these next time for sure! Overall this was one of the best dining experiences we’ve had in months. The food is honest and down-home good, the service is genuinely friendly and the atmosphere is appropriate for the price you’re paying. 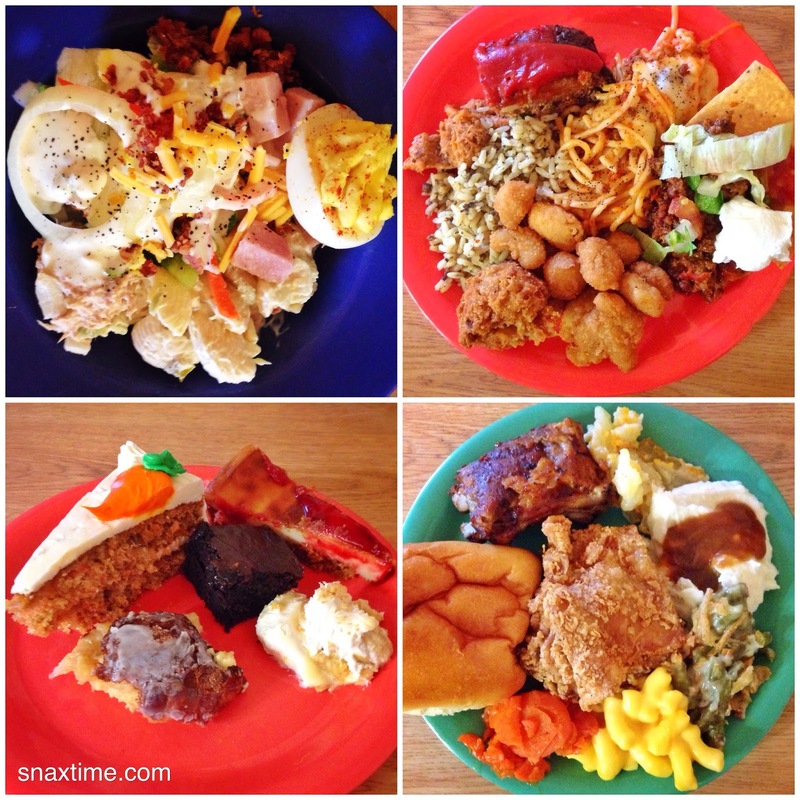 In our opinion, Golden Corral is indeed “America’s Best Dining Value" and this Richmond location rightly deserves its many awards.